- WWE did an angle on 205 Live last night with Tony Nese and Noam Dar brawling in the parking lot before the show began. WWE talent and officials broke up the fight, however Nese attacked Dar from behind. WWE announced in storyline that while Dar didn't sustain any serious injuries, 205 Live General Manager Drake Maverick has indefinitely suspended Nese. In this video, WWE Cruiserweight Champion Buddy Murphy was asked about Nese's suspension. Murphy wouldn't answer if he was happy with what Nese did before talking about his victory at The Royal Rumble. Murphy added that he will defeat anyone who challenges him next. - As noted last night, on SmackDown Shinsuke Nakamura controversially lost the United States Title to R-Truth. The latter pinned Nakamura, whose shoulders were not on the floor. 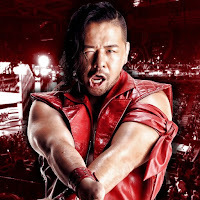 Following the loss, Nakamura posted a cryptic tweet that said "WCW", a potential reference to Bret Hart spelling it out to Vince McMahon before leaving the company. This comes after the announcement that Dean Ambrose would be leaving WWE after WrestleMania. - Following the announcement that Hideo Itami asked and received his WWE release, several WWE stars tweeted out praise to the former GHC Heavyweight Champion. Peyton Royce of the Iiconics posted one last video of Hideo on the road, stating that she respects him. Other stars that created posts include a number of his former 205 Live and NXT stars, including Cedric Alexander and Nikki Cross.